Not Islamabad or Karachi but Italy. A short video published online and spreading on social media offers a glimpse of the dramatic cultural transformation underway in Italy. 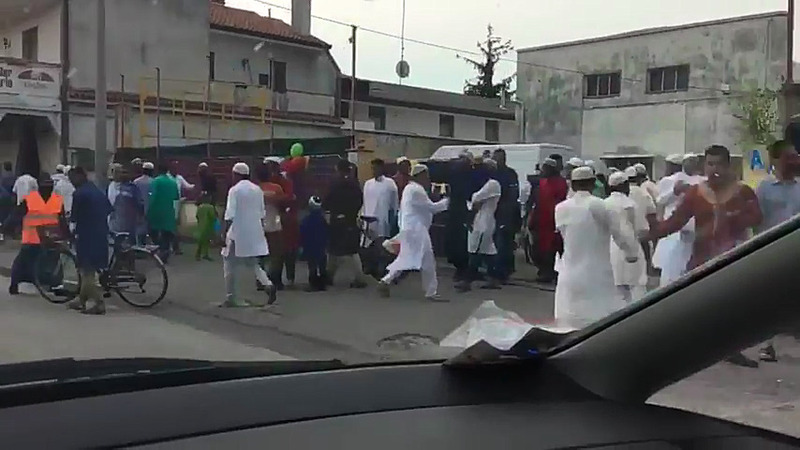 Purportedly filmed in Monfalcone, a manufacturing hub not far from Trieste, in Friuli Venezia Giulia province (Northern Italy), the video shows a large crowd of men leaving celebrations for the Islamic holiday of Eid al-Fitr, which marks the end of Ramadan. The month-long fast observed by Muslims ended on Sunday. Previously unknown to most Europeans, Ramadan and the celebration of Eid al-Fitr have become an increasingly significant part of the cultural landscape with socialist politicians in certain countries even calling for the Muslim celebration of Eid to be added as a state holiday. A stream of men in traditional Islamic garb can be seen leaving the celebration, an uncontroversial sight for the Islamic world but remarkable given that the location is Northern Italy. As with many European countries outside of France and the United Kingdom, mass immigration is a relatively new phenomenon to Italy, and is increasingly transforming its towns and cities. In a similar pattern to Ireland and Denmark, large scale immigration essentially began in the 1990s, with numbers exploding in the 2000s. Meanwhile, on Italy’s southern coastline, huge numbers of African migrants continue to arrive daily, many ferried directly from the Libyan coast by well-funded NGOs and European naval vessels. Over 3,000 arrived on Sunday alone, followed by 5000 more on Monday. Official statistics show the cultural and religious impact of Italy’s porous borders; while only 2,000 Muslims lived in Italy in 1970, the figure had risen to nearly 2 million by 2015, with a rapid increase since that time. Excluding EU citizens, Italy counted just under 4 million foreign residents as of January 2016, out of a total population of 60 million. This figure also excludes illegal immigrants. Worryingly for Italy and its Catholic heritage, the country now has one of Europe’s lowest fertility rates at 1.35 children per woman, well below the replacement level of 2.1 required to maintain a stable population. Video clips such as the one below are increasingly causing scandal amongst Italians, frequently circulating on social media and fueling a nationalist movement which seeks to stem the tide of arrivals.